In today’s Gospel, we have one of the most famous, as perhaps most poignant, of all the accounts of the resurrection appearances of Jesus Christ. It has been a week since Mary Magdalene and the disciples encountered the unsolved mystery of the empty tomb. Today’s passage provides a sequel and an answer to the post resurrection story. The first part is situated in the evening of the Day of the Resurrection whereas the second part, which happens a week later, provides the conclusion to the story. Jesus appears at the first evening, but Thomas shows up a little late. He is not among the Apostles when Jesus reveals Himself. When his friends report to him of their sighting of the resurrected Lord, Thomas does not believe and he sets a test, “Unless I see the holes that the nails made in his hands and can put my finger into the holes they made, and unless I can put my hand into his side, I refuse to believe.” Faith is subjected to the litmus test of empirical proof. A week later, the risen Christ again surprises the disciples. This time Thomas is there, and Jesus obliges his doubts. “Put your finger here,” says Jesus. 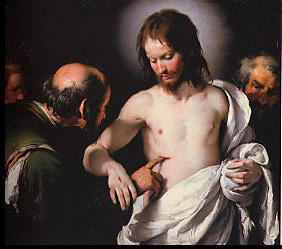 There’s no indication Thomas lifted a finger; rather the sight of Jesus’ wounds seems sufficient to bring Thomas to his knees in an act of recognition and adoration. Many call Thomas the doubting Thomas. But this may seem to be an unfair judgment that singles him out for criticism. To be honest, all of the Apostles doubted, all of them ran away and abandoned Jesus, and all gave in to fear and despair. All of them initially thought that they were encountering a ghost or a disembodied soul. But Thomas went beyond what the others were prepared to do. He went beyond insisting that he wanted to see and touch Jesus in the flesh. He insisted on seeing the wounds and touching them. Not the unscarred and unmarked flesh of his Master, but the very parts of his Master’s severely tortured body that would have caused others to avert their vision. In one sense, by touching the wounds of Jesus, he begins to understand that the risen Jesus is not a ghost, but that he is truly real. But I suspect that there is something more profound in his demand. By encountering the wounds of Jesus, he is able to encounter the authentic Jesus, the real Jesus, the whole deal, warts, blemishes, scars et al. Because he is able to encounter the Jesus that shed his blood on the Cross, he falls to the ground and pronounces a profound act of faith. Thomas is able to encounter Jesus in all of his humanity and all of his divinity. One necessarily should juxtapose this scene with that of another - the vision of St John in the Book of the Apocalypse (5:6, 11-12), where the seer describes the scene of the Lamb that had been “slain” surrounded by thousands of angels singing its praises. I find it infinitely comforting that the wounded one is the object of heaven’s praise. There, before the great throne in glory stands the slaughtered Lamb. Even in the glory of God’s presence, the wounds are visible. In fact the wounds elicit the thunderous praise of the heavenly hosts. There is something wonderfully beautiful and of a mystery about Christ's risen body. His wounds are his badge of glory. His wounds are trophies of his victory. But significantly for us, in Jesus’ wounds, the wounds of human life are never far from the heart of God. He brings the wounds of humanity into the presence of the Almighty and transfigures them forever. In a way, we need no longer be ashamed of our wounds, some are readily visible while others remain hidden. Our Lord’s wounds assures us that our wounds and scars are never hidden from God’s vision. But the wounds of Christ can also be a cause of scandal. It raises serious doubts that cannot be easily explained away. The wounds of Christ reminds us of the wounds that we see in the Body of Christ, the Church. The Church suffers from many visible wounds, caused by persecution on the one hand but also by sin. In the case of sin, the most painful and insidious wound must certainly be of division among its members, which can often prove devastating and scandalising, a cause for disillusionment. But there is hope. As Christ appears after His resurrection, wearing His wounds like trophies, we come to discover the truth that though we may be wounded by much that happens in life, we need not be broken beyond redemption. Likewise, the Body of Christ wracked by division and splits, conflicts between individuals and groups, ambition and competition, the sinfulness of its members, can experience healing and restoration. The necessary path forward is forgiveness. A forgiveness wrought by Christ Himself and not by man. Our Holy Father, Pope Francis, constantly reminds us as did the Church Fathers that the Church is like a hospital, full of wounded and sick people. The sickness is sin whereas the medicine forgiveness. Ironically, one of the most serious sins is a lack of forgiveness, the rejection of the medicine that would be its antidote and cure. We often forget that no Christian is perfect, not even the clergy. When all these imperfect people get together, disagreements, hurt feelings and misunderstandings are inevitable. As much as we find this discomforting, we need to remember that this is the authentic Church, the real Church, the whole deal, warts, blemishes, scars et al. It is a Holy Church, certainly, because Christ has redeemed Her by His Sacrifice on the Cross. But it remains a wounded Church because of the infidelity of Her members. If we can accept a scarred and wounded man as Saviour and Lord, can we not expect the same from the Church, His Mystical Body? If we are only capable of accepting a perfect unblemished Church with perfect members, are we also rejecting the Risen Lord who appeared with His wounds? If we can recognise the intimate connexion between the Bridegroom and His Bride, Christ and His Body, the Church, then we would also be able to recognise the true nature of the gift of Jesus to His Apostles. He offers them and through them, the Church, the gift of the Holy Spirit and the grace of forgiveness, recognising that both are necessary in a Church that continues to be wounded by the sins of her members. This understanding will help us see each other in a new light. No longer would we be repelled by the ugliness of the wounds of the other, but recognise how the Wounded Lord is also present within them. No longer would we turn away those who are sick and broken, but instead offer them healing and the balm of forgiveness. Wounds within the Body of Christ can only be healed through repentance and humility. Repentance requires us to humbly and honestly acknowledge our roles in the wounding of the Body of Christ. Unless there is such recognition, no true healing can take place. Wounds will fester and eventually become gangrenous and life-threatening. The causes of divisions in the Church are many, but ultimately the main reason is that we have taken our focus off Our Lord Jesus Christ. No wonder every hurt or injury often appears to be personal. It is because it’s hard to be thinking about how Christ or the Church is hurting when I’m busy thinking it’s all about “ME”! This is why our faith in the resurrection must never waver. The resurrection reminds us that the One who gets to write the ending is not just a failed hero, but the Risen, Living and Victorious Lord. He will have the final word and not the misunderstandings, pains and hurts that we experience in life. Though our communities often appear to be on the verge of destruction and dissolution through conflict and scandals, its integrity is secured as long as it remains part of the Mystical Body of Christ. Our wounds do not signify the end of life or happiness. In truth, they are living signs of what is to come, Eternal Life and divine beatitude. I know that all of these is hard to believe especially when we continue to encounter the brokenness of our communities. But the Lord reminds us again, “Blessed are those who have not seen but have believed.” This is our Faith. We believe not because we have seen. We choose to believe in order that we may see!